Last week Ann was surprised to hear Dr. Stephen Mihm, a former colleague of mine, lending his voice to a report on American Public Media's popular syndicated news program, Marketplace. I worked for Stephen Mihm my first semester as a graduate history student at UGA (back when I was the best teaching assistant, ever ... I have an award to prove it), helping with his US History until the Civil War survey. We've kept in touch over the past two years, I think in part due to our complementary interests in journalism and design. And it is largely outside of the classroom that I became aware of his interest in US currency, counterfeiting, and the surprisingly naughty history of money in the US. 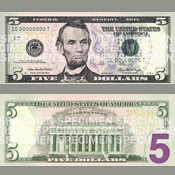 So Ann and I weren't surprised that Marketplace's Tess Vigeland chose to talk with Stephen Mihm about the redesigned $5 bill that will be issued on March 13, its enhanced security features that make the bill harder to counterfeit and easier to authenticate, and what those changes will look like. The story is a good discussion of some of the issues raised by the reissue of the currency. I was especially glad to hear Mihm and Vigeland address a little-discussed aspect of the US's currency redesign campaign – does the frequency with which the US issues new currency actually aid counterfeiters by creating confusion on the part of the consumer? Stephen Mihm teaches courses on the economic, cultural, and intellectual history of eighteenth- and nineteenth-century America. He is the author of A Nation of Counterfeiters: Capitalists, Con Men, and the Making of the United States and is the co-editor, with Katherine Ott and David Serlin, of Artificial Parts, Practical Lives: Modern Histories of Prosthetics.